So says energy technology company Off Grid Energy, as its UBESS (Universal Battery Energy Storage Systems) officially goes live at UPS’s Camden depot today. 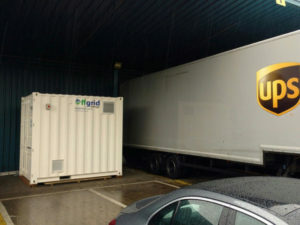 As announced in April, the delivery firm has installed a new charging system featuring static batteries for energy storage at its Camden depot, which could recharge a fleet of 170 electric delivery vehicles without upgrading the power supply from the grid – this in turn enables UPS to look at switching its entire delivery fleet over to electric trucks – up from the current limit of 65 vehicles. As other fleets come under increasing pressure to deploy EVs, driven by council plans for Clean Air Zones, as well as increasing taxation and other challenges for diesel vehicles. Danny Jones, founder and CEO of Off Grid Energy has said that more operators need to look at battery storage and smart charging systems to enable the switch to EVs without putting pressure on a power grid that it claims is “already buckling”. Not only can the battery storage solution bolster power from the grid, it can also return supply back when power is not needed. It can also be fitted with solar panels to increase power – and hence ROI – further. “Rapidly deployable smart-charging and storage systems are an absolute necessity for cities to reap the benefits of EVs,” concluded Jones.